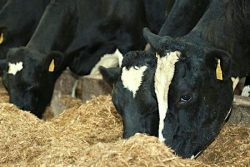 The aptly named Augean biogas project in the U.S. State of Washington is clearing waste from dairy farms and transforming it into fuel –renewable natural gas (RNG)– for transportation. Brightmark Energy, a San Francisco-based waste and energy development company, recently launched the project in Yakima County. Collaborating as Augean Renewable Natural Gas (RNG), Brightmark Energy, Promus Energy, and DeRuyter Dairies will convert 150,000 gallons per day of dairy waste from up to 7,000 cows into 160,000 MMBtu of RNG – the equivalent of 1.4 million gallons of gasoline – and other products each year. Brightmark Energy will manage the joint venture and Promus Energy, the original developer, will serve as the project manager. A key component of the Augean project is the construction of new pipeline infrastructure by Yakima County and Augean that sets the table for RNG projects for other dairies in the area. The Augean project will collect biogas from DeRuyter’s anaerobic digester fueled exclusively by manure. The raw biogas will be cleaned, upgraded, and compressed into pipeline quality RNG, which will be transported through the new pipeline system and injected into the nearby Williams NW regional gas transmission line for sale as vehicle fuel. In addition to RNG, other renewable products generated by Augean’s anaerobic digestion process include biofertilizer, digested dairy fiber for use as cow bedding or as a peat moss substitute, and reclaimed irrigation water. Brightmark’s investment in the Augean project enables DeRuyter to upgrade its 12-year-old manure collection system and digester to increase its capacity and conserve water. DeRuyter anticipates that the project will save the dairies more than a half of a million dollars each year in operating and environmental compliance costs. The Augean biogas project is also supported by a $1.4 million grant from Yakima County and a $500,000 Rural Energy for American Program (REAP) grant from the U.S. Department of Agriculture. Dairy-derived RNG is the lowest carbon intensity transportation fuel available because it greatly reduces the emission of methane, a powerful greenhouse gas, from lagoon-stored manure and wastewater. The process also benefits the local environment by processing and recovering much of the nitrogen in manure as a value-added biofertilizer that can be efficiently transported to crop fields that need the nitrogen and other nutrients, displacing chemical fertilizers and creating a sustainable cycling of nutrients that prevents water and air pollution. Other advantages include the drastic reduction of pathogens and odor in the process water and products recovered from the system. In addition to the Yakima County project, Brightmark is currently developing similar biogas projects in New York, Wisconsin, Florida, and Minnesota, and the company is actively seeking feedstock suppliers with an interest in collaborating on waste to energy projects. Brightmark Energy develops, owns and operates waste and energy projects. Promus Energy LLC, based in Washington State and New Mexico, converts organic wastes into low carbon intensity, high-value renewable products, focusing specifically on dairy-derived renewable natural gas (RNG) and recovery of nutrients and fiber.